The Concours of Elegance is normally full of cars from all over the world; America, Italy, France, Great Britain, Germany and more. But, you don’t tend to see too many representatives from the former republic of Czechoslovakia, which is why I’m particularly fond of this beautifully restored Tatra 77, coming to the 2017 event. 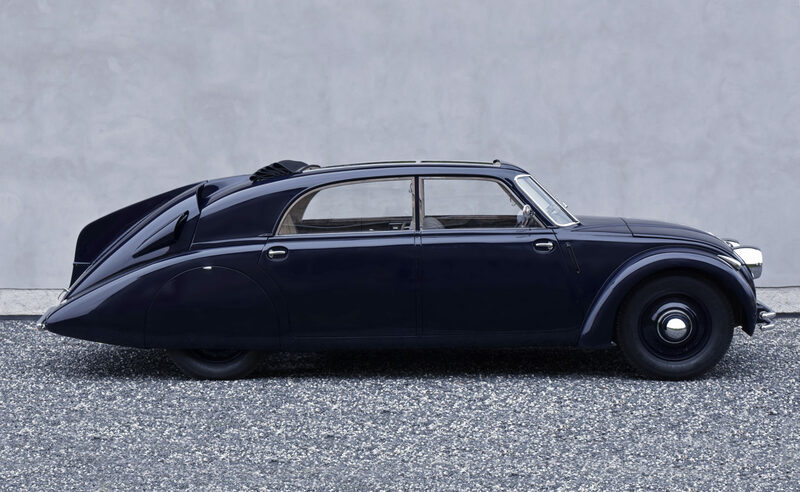 This is one of the first Tatra 77 streamlined cars ever produced, of 105 units in total built between 1934 and 1936. The Tatra was unusual in that it was designed with aerodynamics in mind from the very beginning, resulting in a drag coefficient of 0.36 – Mercedes’ latest AMG-GT sports car matches that. First presented to the public on a Carlsbad road in Czechoslovakia on 5 March 1934, and again at the Berlin Motor Show on 8 March 1934, the Tatra 77 deservedly became a sensation. This particular version features a unique option, a large sliding roof manufactured by Webasto, specified by the car’s first owner Josef Wait. This example has undergone extensive high-level restoration that has only recently been completed. The restoration process placed emphasis on the preservation of all of the vehicle’s details and use of original materials and technology. The dark blue exterior is identical to the original paint found on the vehicle during restoration. The leather interior used during restoration was custom-built to match a sample of the original material. It’s a quirky addition to this year’s Concours of Elegance line-up, but one that fully deserves its place in the grounds of Hampton Court Palace among some of the rarest and most incredible cars in the world.